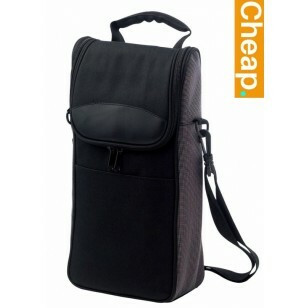 This 2 bottle cooler bag is great for personal and business use. It also comes with a waiter's tool as well. This is perfect for when you want to keep your own personal bottles cool or your customers bottles cool during serving. It has a zippered flap opening over the main insulated compartment. The waiters tool, which is a cork remover is under the front of the flap closure. It also has a front pocket for small thinner items if needed. It also has a padded carry handle as well as an adjustable shoulder strap. It is made of durable 600D polypropylene. It can withstand daily or occasional use. We deliver bags in bulk Australia wide only. One solid colour choice available which is black. A full color print of your graphic is available for an additional: $3.00 each.